Kakao, the operator of South Korea’s most-used mobile messenger KakaoTalk, on Tuesday pledged to focus its artificial intelligence capabilities on homes and cars. Kakao has been heavily investing in AI over the past two years. 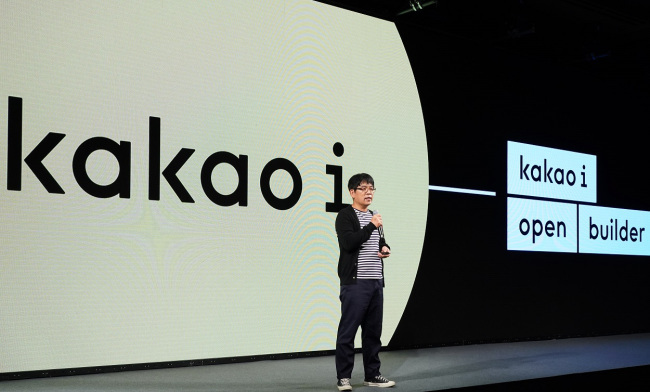 It launched its proprietary AI platform Kakao I, equipped with features such as voice recognition, natural language processing, image search, recommendations and translation, as well as a smart speaker running on the platform, Kakao Mini. The company plans to continue ramping up its AI capabilities in the years ahead, focusing on making people’s cars and homes “smarter,” according to Kakao vice president and head of its AI division, Kim Byung-hak. “In building our AI services, our big question was: Where are the biggest pain points for users that have yet to be resolved? The answer was homes and cars,” said Kim during Kakao’s inaugural developer’s conference in Seoul. For cars, Kakao is working to forge an in-car environment where people can access features that previously required the use of a smartphone, such as navigation and mobile messaging, via voice commands. It has partnered with Hyundai Motor Group for the task. Under the partnership, voice-activated features now offered by the Kakao Mini -- such as streaming music as well as sending and receiving KakaoTalk messages -- will become available in new Hyundai and Kia car models to be launched in 2019. The vehicles equipped with Kakao I will also be able to perform tasks such as opening a sunroof or lowering the direction of the air conditioner, via voice commands. To make its AI capabilities available beyond Hyundai car owners, Kakao also plans to bring Kakao I to its mobile navigation app Kakao Navi by the year’s end, Kim said. Alongside intelligent car management systems, Kakao said it wants to create smarter homes that can be controlled and managed via Kakao I’s voice command capabilities. Considering that most Koreans live in apartments, the Korean mobile giant has joined hands with GS Construction and Posco Construction to build smart apartments equipped with Kakao I from the initial design. People would be able to turn off the lights, close the gas valve, and maneuver home electronics via voice commands. Even when outside, they would be able to command certain actions inside their apartments via a message on KakaoTalk. To further expand the scope and diversity of its AI ecosystem, Kakao plans to open source Kakao I’s application programming interface to any interested developer through the launch of a new website called “Kakao I Developers” by December. Until now, Kakao had been providing Kakao I’s API in a limited format through the Kakao I Open Builder platform, which was made available only to partner companies building new services utilizing Kakao I’s underlying technologies for chatbot and voice command features. Kakao’s AI division chief also highlighted how Kakao I has been using mass user data collected via the Kakao Mini smart speaker, whose demand has continued to rise. Since its launch in November 2017, Kakao Mini has processed more than 200 million voice commands, and helped greatly improve Kakao I’s natural language processing engines. As a result, Kakao I’s voice command recognition failure rate has halved from 12 percent to 6 percent, Kim noted. Based in the tech-focused city of Pangyo in the south of Seoul, Kakao is Korea’s dominant player in the mobile technology space. It provides services ranging across finance, transportation, content and music streaming. It also provides internet portal services via Daum.